This entry was posted on Monday, March 5th, 2018 at 9:40 am and is filed under circus of life. You can follow any responses to this entry through the RSS 2.0 feed. Both comments and pings are currently closed. At the Bong Recreation Area, is it BYOB (bring your own bong) — or are bongs provided free of charge??? There is a lake on the other side of the houses across the street. It is named Mirror Lake, but lacks that sign. Maybe we should make one. All hilarious but time travel is my favorite. LOL! Oh heavens–and like that, my tension headache slipped away. Thanks so much–I needed to read all that today. TheChattyIntrovert says: Oh heavens–and like that, my tension headache slipped away. The amazing healing power of Bluebirdofbitternessessness. Bong Recreation Area? 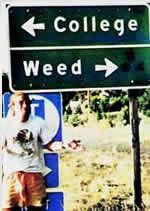 It’s where you end up when you make the wrong choice at College & Weed.